How to Best Manage the Greyhound Temperament? To manage the Greyhound temperament, and in fact any dog's temperament, you have to look at the breed's history and purpose. These intelligent and graceful dogs became extremely popular in 18th century England. They were used to chase down game such as rabbit, which was a staple part of the dinner menu in those times. Greyhounds are one of the fastest animals on Earth, and this speed gave rise to the greyhound racing industry. Many pet greyhounds have come from this industry and been re-homed after their racing career comes to an end. As a pet, the Greyhound is ideal. They don't need much grooming, nor do they need a lot of exercises. They are quiet and affectionate and will be happiest curled up on the couch with you. Although they are quite large, they can live happily in an apartment as long as they get a daily stroll. The quiet Greyhound temperament makes him an ideal candidate for apartment living since he rarely barks. I would strongly recommend that if you do invite a greyhound into your family that you allow him to live inside. They have a thin hair coat and very little body fat, both of which make them feel the cold. These Grey Hounds are having a blast!! The athletic Greyhound temperament gives him a strong desire to chase. The Greyhound is a sighthound, which means they hunt by sight rather than by smell. They are hard-wired to chase. This can cause problems if you share your life with other small pets. Dog temperaments vary widely between individuals, and your Greyhound may not have a strong prey drive. If that's the case, then he will probably learn to live peacefully with your cat or other small pet. However, you must never be relaxed about this, and always supervise your Greyhound around other small animals. Greyhounds traditionally wear a basket muzzle when they are out in the community, just in case they notice potential prey. If they should catch something, they won't be able to do it any harm. One aspect of the Greyhound temperament that can be dangerous to him is his tendency to focus on his prey, to the exclusion of everything else. If your dog sees something moving, he is likely to run it down and he will be totally focused on the task at hand. He isn't likely to hear you calling him back. He also won't pay much attention to where he is going. This means he may run into a fence, or across a busy road. It is essential that you keep your Greyhound on a leash unless he is in a securely enclosed area where he won't be able to get up to his full speed. The affectionate Greyhound temperament can make him prone to Separation Anxiety. Separation anxiety can be a characteristic of many dog temperaments, but the retired racing Greyhound is particularly susceptible to this. Racing dogs spend their entire lives living in a kennel situation with lots of other dogs for company. They can become stressed when alone. The best solution for this problem is to adopt another Greyhound. If your budget or lifestyle doesn't allow for this, then invest in some chew toys such as Kongs to keep your dog occupied until you get home. Because he has spent so much time in kennels, he will probably be more settled in a large crate while you are out. The usual Greyhound temperament is shy and reserved. Socialize your dog from puppyhood to give him confidence and help him to grow into a well-adjusted adult. This isn't always possible with a retired greyhound, as he will be already mature when he joins your family. While your dog's temperament may not change, you can help him to be less nervous. It is never too late to take your Greyhound out and about so he can become familiar with new situations and people. You will need to take it gently, and use rewards to encourage him. You may find that he will startle at some sounds, particularly those that remind him of the noises he heard at the track. Of all the dog breeds and dog temperaments out there, I can wholeheartedly recommend the Greyhound as a pet for anyone, whether they have a young family or are a senior citizen looking for a canine companion. They are the perfect pet, and if you do adopt one of these gentle animals, you'll very quickly fall in love with the Greyhound temperament. It might be surprising, but retired Greyhounds actually do not require a ton of exercise. After their racing careers are over, Greyhounds tend to be couch potatoes. They still need daily walks and occasional runs in a fenced area, but they are good pets for people with lower activity levels. Greyhounds are an extremely ancient breed. Although their exact story is unknown, most people believe they originated over 5000 years ago in Ancient Egypt. Artwork from that time period depicts canines that strongly resemble the modern Greyhound dog. The history of Greyhound dog racing dates back to the 1800s in England. However, the modern industry developed in America in the early 1900s. Today it is a gambling sport in America and in a few other countries around the world as well. Greyhounds are the fastest breed of dog in the world. Greyhound dog speed can exceed 40 miles per hour. Historically, when their racing career was over, Greyhounds would be euthanized. However, thanks to Greyhound Rescue groups, most retired racers are now placed in homes. Many animal rights groups have serious concerns about the welfare and treatment of Greyhounds in the racing industry. 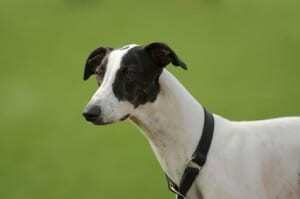 The Sloughi is an African sighthound that looks very similar to the Greyhound. However, the Sloughi is a little bit smaller and is much less common. Greyhounds have a very distinctive appearance. They are tall, sleek, slender, aerodynamic dogs that are built for speed. The average Greyhound weight is between 60 and 70 lbs. The average Greyhound height is between 27 and 30 inches. Greyhound colors come in a lot of variety. In fact, according to the AKC breed standard, Greyhound dogs can come in any color or pattern. Some of the most common colors are fawn, black, white and brindle. Training your greyhound can be a very rewarding experience. The intelligent Greyhound temperament makes him a good candidate for obedience training. If you adopt a former racing Greyhound, your Greyhound will have a lot to learn about living as a house pet. Many ex-racing Greyhounds have never experienced houses, so things like stairs, vacuum cleaners, laundry machines, etc., are all new to them. Be patient as they adjust to their new life. Give them lots of positive reinforcement as they go through new experiences. On the plus side, most racing Greyhounds are crate trained at the track, so your adopted Greyhound will probably already be comfortable relaxing in a crate when you leave the house. Crate training also expedites the housetraining process, so that is a huge plus! When it comes to obedience training your Greyhound, make sure you use positive, force-free methods with these sensitive dogs. Do not use choke chains, pinch collars or shock collars. While these are not recommended for any dog, these collars can actually do serious damage to the Greyhound’s delicate throat. In fact, you should order a special collar specifically made for this breed. Due to their unique body shape, Greyhounds rarely “sit.” However, they can learn to lie down on cue. Train your Greyhound to come when called. However, even after training, never let your Greyhound off the leash in an unfenced area. Greyhounds make excellent competitors in sports such as lure coursing, nosework and rally obedience. They are also exceptional dogs for therapy work. Maybe you and your Greyhound can explore this world of canine sports. For help with training your Greyhound dog take a look at The Online Dog Trainer by Doggy Dan. Doggy Dan is an expert Dog Trainer based in New Zealand. His online resource contains Hundreds of Excellent Dog Training Videos that will take you step-by-step through the process of developing a healthy, happy well-behaved dog. Greyhounds are clean, low-maintenance dogs when it comes to grooming. The Greyhound does not require professional grooming. You can keep the coat healthy by occasional baths and brushing at home. You should also trim their nails, clean their ears, and brush their teeth at regular intervals. Greyhound fur does shed, but it is very manageable compared to other breeds. However, their hair is not considered hypoallergenic. Although, the greyhound coat produces very little oil, so people with mild allergies can sometimes do ok with this breed on a case by case basis. Another very serious condition is called Gastric Torsion (Bloat). When a dog experiences Bloat, their stomach expands and sometimes twists. This condition causes severe abdominal pain and it must be treated immediately with corrective surgery or the animal could die. You can reduce the risk of bloat by feeding multiple, small meals per day. You can also encourage your dog to eat slowly using a puzzle feeder or slow feed bowl. As with all dogs, your Greyhound should visit the veterinarian once per year for an annual checkup and vaccinations. Your Greyhound should also stay up to date on heartworm, flea and tick preventative at all times. Spaying and neutering are highly encouraged for health reasons, behavior reasons, and to reduce the overpopulation of animals in our society. Most Greyhounds will be spayed or neutered prior to adoption. With top-notch care, the average Greyhound lifespan is between 10 and 13 years. Most people acquire their Greyhounds through adoption agencies. You can find a list of Greyhound Rescue groups through the National Greyhound Association. You can also find a Greyhound for adoption through your local chapter of Greyhound Pets of America. It is rare for Greyhounds to be available for adoption in your local animal shelter or humane society. However, if you visit your local shelter, the staff at the organization can probably refer you to local Greyhound Rescue groups in your region. 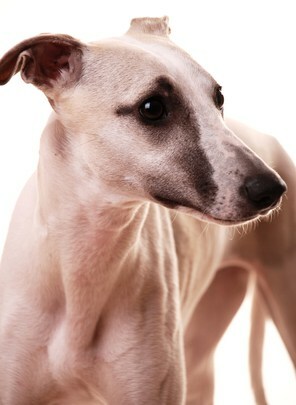 Likewise, you can search for local adoptable Greyhounds through websites such as Petfinder.com and Adoptapet.com. Your adoption fee for an adopted Greyhound will probably be between $150 and $250. This price generally includes all vetting, spay/neuter, heartworm test, muzzle, and collar. Adopting a Greyhound is an extremely rewarding experience. You get to watch them blossom as they adapt to living life as a family pet. It takes some time for them to acclimate to a home after years at the track, but once they settle in, they become fabulous family pets. It is rare to find a Greyhound puppy for sale to the general public. Most Greyhound puppies are bred specifically for the race track or for the show ring. Very few Greyhound breeders sell their puppies to the general public. If you decide to purchase a Greyhound for sale directly from a breeder, be prepared to make a big investment. The typical Greyhound price from a reputable breeder will be anywhere from $2,000 to $7,000. It is important to do your research to make sure your Greyhound puppy comes from a responsible breeder. Never purchase any breed of puppy over the internet or from a pet store. Always do your due diligence and travel to the breeder’s facility to meet the breeder in person and inspect the premises. The gentle and even-temperament Greyhound temperament makes this breed a beloved household pet. Of all the dog breeds and dog temperaments out there, I can wholeheartedly recommend the Greyhound as a pet for anyone, whether they have a young family or are a senior citizen looking for a canine companion. They are the perfect pet, and if you do adopt one of these gentle animals, you'll very quickly fall in love with the Greyhound temperament. Next post: Labrador Retriever Temperament and Behavior: What To Expect?